Our world today is becoming increasingly virtual, dominated by the internet. This has changed our social fabric entirely, right from the way we communicate to the way we learn and think. Today, inter-continental messages are delivered in an instant through email and social media messaging platforms such as WhatsApp, Facebook, and Skype. This has inherently changed our understanding of distance, space and time- the United States from India no longer seems a world away. Naturally, these changes have also affected the way higher education is delivered. In the Western World, credit-based distance learning, blended learning – distance learning for some subjects (credits) and classroom learning for some others is becoming increasingly acceptable. It is not uncommon to hear people speak about taking individual courses or completing their undergraduate and post-graduate degrees entirely online. These online courses allow individuals greater flexibility in terms of their schedules. People with full-time jobs are able to access higher education opportunities through distance learning models such as online courses as they do not have to commute physically to classrooms and are able to complete the coursework at any point in the day as opposed to a fixed class schedule. This allows individuals to focus on their jobs, earn while learning new skills. Furthermore, technology-based distance learning modules have also become increasingly application based. This allows students to physically engage with the content they learn. In spite of the availability and accessibility of technology, Indian higher education modules still are content based. Students are expected to study content from textbooks and supplementary reading material and are tested on this content through written examinations. For poorer students as well as adults who want to re-skill themselves, this becomes alienating as they may not be able to come to college/university (physical space) for the entire duration of the course. For example, a mason/beautician who wants to up-skill and re-skill himself/ herself might find traditional vocational or higher education opportunities to be difficult as he/ she is unable to access it at the time and pace he/she wants to set for himself/ herself. Seeing this, she often does not join skilling/ vocational / higher education programmes. And, if she cobbles up the courage to join the course she becomes demotivated, branding the course to be too hard and might be motivated to drop out of the course entirely. In the end, she would not have any higher educational qualifications and would struggle in a job market that has become increasingly reliant on education degrees. Education modules in India suffer from being theoretical and do not emphasize practical experience and therefore, do not recognize skills. Each topic that is learned must be applied in real life, allowing students to engage with their content and in turn, understand it better. A person with work experience, therefore, might benefit from such a model of higher education as she is able to apply the learned content to various aspects of his life, thus engaging with it. Higher education modules in India need to adopt best practices that technology-assisted distance learning models have created and must start valuing practical experience and skill-based learning. This is especially important for vocational educational institutions as such models would engage Indian laborers and unskilled workers, who otherwise would be discouraged to enroll in any vocational or higher education institutions and courses. Such courses would allow laborers and unskilled workers to complete the responsibilities of their day jobs, allowing them to earn a livelihood while getting certified through distance learning modules. These models would also allow a wider demographic to access higher educational opportunities. Higher education in India is still heavily defined by age group- students who complete their undergraduate education are between the age group of 21-22, after which most students go on to complete their post-graduate education almost immediately. As a result of this, the educated incoming workforce is generally aged between 24-30, depending upon the length and duration of post-graduate programs that tend to vary from sector to sector. It is generally quite difficult for students above the age of 30 to access either vocational or higher educational opportunities in India. However, educational modules in India do not follow this. It is perfectly acceptable in many countries for students to complete both undergraduate and post-graduate educational degrees part-time while earning their livelihoods through sources of employment as well. Such models would be exceedingly successful in vocational education courses in India, allowing laborers and unskilled workers to access higher educational opportunities through distance learning. 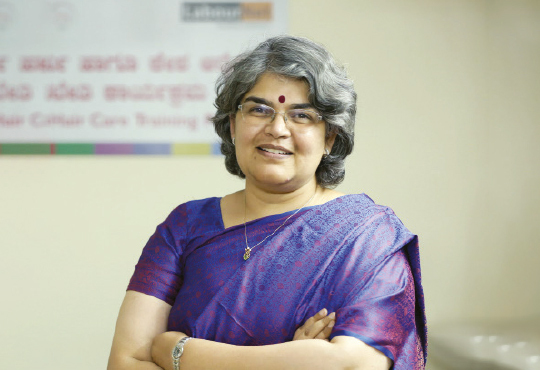 The CEO and Co-founder of LabourNet & Shreya Srinath, State University of New York, Geneseo, Gayathri Vasudevan is an experienced person with a demonstrated history of working in the civic & social organization industry. She is skilled in Sustainable Development, Social Enterprise, Corporate Social Responsibility, Strategic Planning, and Rural Development. She is also a strong business development professional with a Ph.D., focused in Development Economics and International Development from the University of Delhi.